Earring styles go in and out of fashion depending in large part on whether current hairstyles cover or expose the ear. Both Pearls and Coral have enjoyed long popularity, with baroque (irregularly shaped) pearls being used extensively in the Renaissance. The Coral is natural bamboo coral (dyed a deeper red) and is not under threat of extinction. 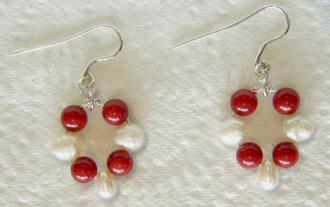 The cultured freshwater pearls are a natural white colour, and the connectors and ear-wires are handmade on the premises from Sterling Silver.